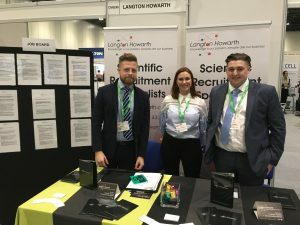 If you are visiting ELRIG Drug Discovery at Excel Arena in London over the next few days, then call and see our team! We have Ben Atherton Owen Fothergill in attendance, along with our Directors Tom Dempsey and Emma Howarth. Emma Howarth will be doing a talk tomorrow at 2pm in the Platinum Suite. So, if you are post-doc, postgraduate, early career researcher or professional (ECP) Scientist looking to start or build your career in drug discovery? If so, understanding how best to prepare for your next step, and maximize your chance of success is critical. Get practical advice on preparing your ‘industry appropriate’ CV and interview technique.